Raith fell to a humiliating five-goal defeat at the hands of a resurgent Livingston side on a sobering afternoon for Grant Murray’s team. Wounded by the early sending-off of defender Ross Perry for a professional foul, Raith never recovered and fell to their worst home defeat of the season. While the sending-off was the main talking point as Raith fans streamed out of Starks Park long before the final whistle, the home midfield was overrun at times as Livingston’s pace through the central third reaped a festive harvest with a resounding win. On paper, both of today’s sides should be harbouring realistic play-off ambitions in this season’s Scottish Championship. Raith have shown consistency in taking points off most opponents, resulting in a top-half league position and progress in Cup, and few would argue Livingston’s playing staff contain some of the League’s competitions trickier players. Livingston however, have fallen down the table since September, and are without a recent League win. Despite having a comparatively stubborn away record – only Hibs Hearts and Rangers have conceded fewer goals away from home – Livingston had yet to take three points from an away match this season. Raith went into today’s game as clear favourites. Without their troubles to seek on the park, Livingston also suffered the indignity of a points deduction for breach of the SPFL’s rules regarding taxation. Recent experience in Scottish football – noting both Dundee and Hearts have followed similar traumas with positive runs based on a looser more attacking style of play – suggested Livingston would still prove a handful for Grant Murray’s side. Raith made one change from last week’s Cup win over Stirling Albion – Jimmy Scott omitted altogether, with young Ross Callachan making a first competitive start of the year. Livingston contained several familiar faces – not least in the form of captain Simon Mensing. Drama came within moments of kick-off. With Raith’s defence still picking their positions, Glen beat Watson to a header, freeing Burchill behind Perry. With an arm on his shoulder, the former Celtic striker went down. Referee Allan showed Perry a red card. A former defender himself, Murray looked on coldly as his young defender walked down the tunnel. While opinion focussed on the referee’s early red card, players are surely aware that the rules are the same no matter when offences take place during the ninety minutes. With experienced forward play and naive defending, Burchill and Perry had determined the outcome in the opening two minutes. Jordan White fired home the resultant penalty. Manager Murray faced an immediate dilemma – Stewart was sacrificed, with Dougie Hill joining Watson at centre-half as Raith faced a resurgent Livingston with ten men. The visitors smelled a first away win of the season. While Raith struggled to get support to Nadé in central positions, Livingston committed numbers forward. Burchill, Glen, White, and Mullen all interchanged in advanced roles, leaving Raith’s revised back four facing a wave of incisive flicks and runs from the visitors’ pacy attacking foursome. Referee Allan denied what seemed a clear penalty with ten minutes gone – Nadé swept beyond both Mensing and Jacobs, and in a tangle of arms and legs, fell heavily in the area. Neither the referee nor the stand-side linesman reacted – Nadé was incensed, earning a yellow for his protests. Robbed of a penalty and a possible Livingston red card, Raith fans vented their frustration at the referee’s decision. The first twenty minutes had real bite – Livingston sensing three points with their tails up following their early opener; Raith, fired by a sense of injustice. McKeown curled a free-kick just beyond Jamieson’s post, and Anderson’s cross shot was also gathered by the visiting keeper. Livingston sub Beaumont earned yellow for a trip on McKay escaping through midfield. 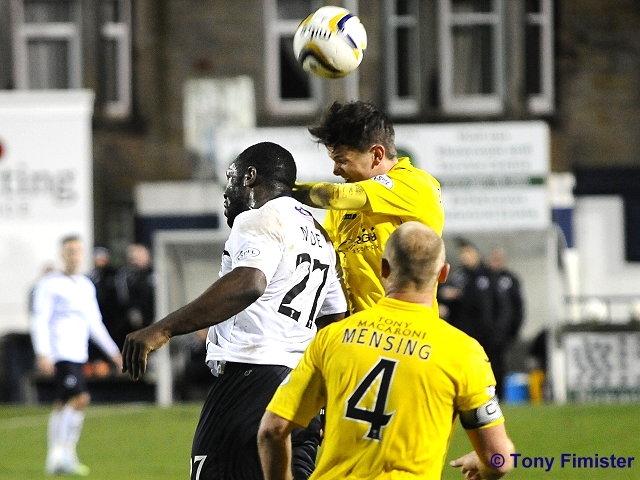 As the half wore on, Livingston created real momentum, catching Raith’s defence on their heels. Glen and Mullen were lightning fast in supporting Burchill and White – the experienced Burchill dropping off, and pulling Watson and substitute Hill out of position to create spaces behind. On twenty-two minutes, Livingston doubled their advantage White’s cross into a crowded area allowed Burchill to leap highest to beat McGurn. With both Watson and Hill several inches taller than the former Celtic striker, Burchill did exceptionally well to climb to head home. 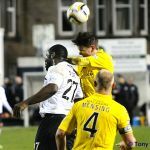 Raith had another penalty claim turned down on the half-hour – Anderson was released by Nadé between Keaghan Jacobs and young full-back Rutherford. Caught between two bodies, Anderson went down in the area. Again, referee Allan turned away. Until half-time the pattern remained – Raith trying to play a high line, and Livingston’s runners raiding the spaces behind. At times, the home defence appeared like rabbits in the headlights, blinded by the waves of yellow shirts firing forward. Hill, while perhaps match-fit, was clearly not match-sharp, with several hasty clearances and missed challenges. Watson struggled alongside him. With Livingston’s Jacobs and Beaumont advancing from their foundations in front of their back four, Glen and White each had opportunities to spring down the channels between Raith defenders. The pair created a clear opening for Mullen to shoot, although his scuffed effort didn’t trouble McGurn. Gallacher’s header from a Livi corner had McGurn stretching to cover his angles. Despite Raith’s vulnerability at the back, Livingston themselves were giving the hardworking Raith front-men the incentive to break. Keeper Jamieson fumbled a McKay corner moments later, without a Raith player close enough to profit. In forty-three minutes, Raith were three down. Mullen flicked for Glen to burst through, his shot beating McGurn low to the keeper’s left-hand side. With the home support’s disapproval ringing in their ears, Raith hit back almost immediately. A deep clearance allowed Anderson to break in from the left. The winger showed strength and tenacity to cut back inside Mensing, shooting through Jamieson. While much rancour was directed toward referee Allan at the break, arguably the main influence on the first half was visiting manager John McGlynn. Rather than wait for Raith to tire, his decision to send his team forward in numbers was instrumental, to capitalise on Raith’s lack of defensive certainty. Raith’s defence creaked following Perry’s departure, encouraging a vibrant visiting front-line upon them. The deficit at half-time, whilst determined by the sending-off, was a fair reflection. The second-half didn’t live up to the drama of the first. While Raith’s share of possession improved, and Anderson and notably McKay both mounted regular raids down Livingston’s flanks, the three points were on their way to West Lothian well before full-time. From the opening of the second forty-five, a bruised home side increased their tempo, and raised the temperature of the home support. McKay swept passed Jacobs allowing Callachan to surge toward goal, a Watson header from a corner was nodded clear, and Anderson drove a loose ball narrowly over in Raith’s best spell. Raith’s clearest opportunity of the second half came on the hour mark. Thomson crossed to find Nadé, the Frenchman’s instinctive flick allowed Anderson to shoot, only for Jamieson to claw the goal-bound effort to safety. At the other end, McGurn’s goal still looked under pressure. Mullen tested the Raith keeper from twenty yards, drawing a fine save. Nadé’s battle with centre-half Gallacher was the match’s main physical contest – although the Raith striker escaped several times into wide positions, and Gallacher survived two penalty claims, the Livingston defender rarely left his team-mates’ exposed. Referee Allan required to separate the pair at numerous set-plays, however Nadé seldom looked the danger he has in recent games. Livingston’s driving forward play was no doubt calculated partly to leave Nadé isolated upfront, with Raith unwilling to commit another striker to create a foil for the burly striker. With twenty minutes to go, Raith continued to create half-chances, but not the clear-cut scoring opportunity which would have reduced the deficit to one. Hill’s nod back across goal from a corner allowed Watson an opportunity, but the Raith defender’s header looped over Jamieson’s cross-bar. Nadé showed great strength soon after, only for Callahan’s shot to be blocked away. McKay and Anderson continued to drive down both flanks and often come inside, only to be crowded out by a plethora of visiting defenders. While Raith enjoyed some possession, the quality in the final third was drowned out by the numerical disadvantage and energy-sapping intensity of running the extra yards to create space. Livingston were happy to concede a certain amount of possession, confident of picking Raith off with attacks from distance. A clever dummy from Mullen allowed White in, only for the Lions striker to go down under contact from Thomson – the away support howled in anguish as Allan waved away protests. Thomson, who enjoyed an uncomfortable afternoon, escaped without sanction. Shortly after, substitute Ogleby teased McKeown with good close control before guiding a side-footed effort inches wide of McGurn’s right-hand upright. The quality of Livingston’s chances was a clear difference between the teams – with Raith’s midfield losing the central third, Watson and the tiring Hill were left facing attacks from both flanks and through the middle. In the seventh-eighth minute, White found space to cross having drawn Watson wide, Mullen’s sharp run creating space to head back across McGurn for Livingston’s fourth. The fourth goal finally knocked the wind out of Raith sails. The final minutes saw Livingston passing well through midfield, and despite Raith adding some energy with the bustling Conroy and the muscular Elliot brought on in the later stages, Livingston were able to see out the victory to the delight of the small band of travelling fans housed in the Railway Stand. A final indignity for the home side – Mullen’s shot was blocked by Watson but fell to McKenna; with McGurn committed, the Livingston substitute fired home a fifth. With three demanding games coming up over the festive period – trips to Dumbarton and Falkirk book-ending a visit from Hibernian, Grant Murray has a real task ahead to galvanise his side following this day to forget at Starks Park. Penalty and a straight red for Perry for pulling Mullen back. Idiotic. Goal Livi. White puts it beyond McGurn's reach. Rovers with it all to do now. Boos for taking Stewart off, only a shade quieter than Perry's "feedback" from the stands. Good play from Nade, beats one man but can't beat the second. Rovers dominating despite being a man short. Jamieson booked for time-wasting. In the 39th minute. Three chances, three goals. Unbelievable. With 11 men this would be a very different game. It's been all Rovers other than three passages of play.